Danica Patrick may be the hottest female driver right now but she is far from the first. Yes, auto racing is a male dominated sport but throughout history women have been there, competing wheel-to-wheel with the men we all revere. Now one of the world’s long forgotten female racers is finally being given the recognition and respect that has eluded her for too long. Hellé Nice (born Mariette Hélène Delangle on December 15, 1900, died October 1, 1984) was a model, dancer, and Grand Prix race driver. In 1929, she won an all-female Grand Prix race at Autodrome de Montlhéryin the process setting a new world land speed record for women. In 1931 she drove a Bugatti Type 35C in five major Grands Prix in France as well as in the Italian Grand Prix at Monza. A master of showmanship, Hellé Nice was easily recognizable in her bright-blue race car. Although she did not win a Grand Prix race, she was a legitimate competitor, and frequently finished ahead of some of the top male drivers. Auto racing ceased in Europe with the advent of World War II. The Hellé Nice Foundation has announced a ceremony to be held in Ste Mesme, France on September 4, 2010 honoring Hellé Nice. I’m not the most knowledgeable person on Grand Prix history. What little I know I learned from reading Henry N. Manney III and others in Road & Track and Car and Driver. 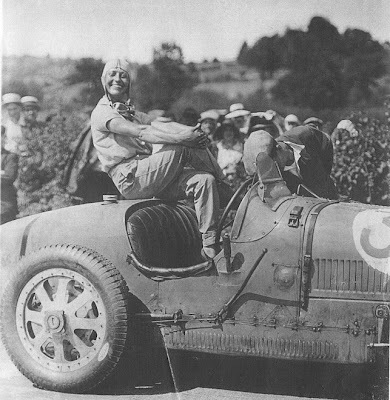 I have heard of René Dreyfus, Louis Chiron, Achille Varzi, Tazio Nuvolari and others but I had never heard of Hellé Nice until I received the press release announcing the Hellé Nice Foundation’s ceremony. So I did some research and found a fair bit of information. Hellé Nice was a very interesting woman, and very attractive. Like too many celebrities, she lived a fast life, soared too close to the sun, and crashed and burned. She was the victim of a very salacious rumor that essentially ruined her life. It is good that she is finally being recognized; it is good that there are organizations like The Hellé Nice Foundation. Thank you so much for writing this article. I have taken a break from packing to go to the ceremony to write this comment. Finally, 26 years after her death, Hellé Nice is being honored, and we are so happy to be doing this. The ceremony will be Saturday, Sept 4! Lots of vintage cars, male and female drivers from around the world, and the unveiling of a beautiful plaque in her honor, to publicly mark her final resting place! The Hellé Nice Foundation also has a FB site - check there on Sunday for the latest! Thank you again!